During the first half of the show we spoke with Andrew Tay, who has been very busy this past summer. Andrew spent time in Europe with DanceWeb as a part of the Impulstanz Festival in Vienna. Next he was off to Berlin for the Tanz im festival. After giving us the inside scoop on these experiences, he tells us about another project he managed to fit in this summer. 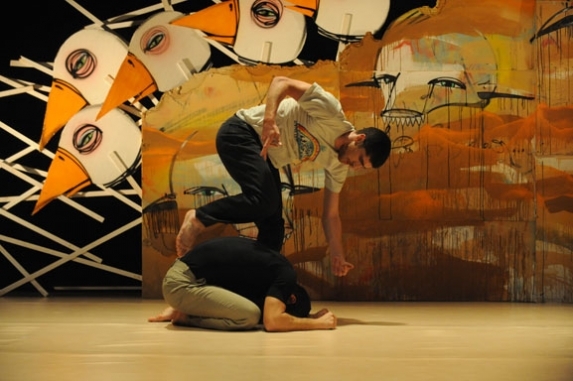 He co-choreographed chapter 4 of Les Chemins Invisibles, the Cirque du Soleil event presented in Quebec City. For the event he worked alongside his long-time collaborator Sasha Kleinplatz. Gabrielle Coulter chimes in after the break to introduce herself as an artist to the listening audience (the last time we had her in studio was during our Queer Artists Episode back in August). Then she tells us about a few events coming up that she is involved in. We are grateful for her coming in an expanding our horizons. She promises to post all that info on our facebook page, so check it out. Next J.D reviews Quiet (2009), choreographed by Arkadi Zaides. The show was presented at the MAI last weekend. To finish up, J.D. & Allison talk about The Tempest Replica in a little more detail. This was the show that Crystal Pite choreographed, and her company, Kidd Pivot present at Agora last weekend to a sold out audience.